U.S. stocks closed in closed lower on Thursday, as major indexes consolidated their gains after a five-day rally that was driven largely by optimism over the strength of corporate earnings and fresh concerns about global trade tensions sapped buying enthusiasm on Wall Street. The Dow closed down 0.5%, or about 135 points. The Dow Jones Index closed at 25064 level erasing some gains after the rally. 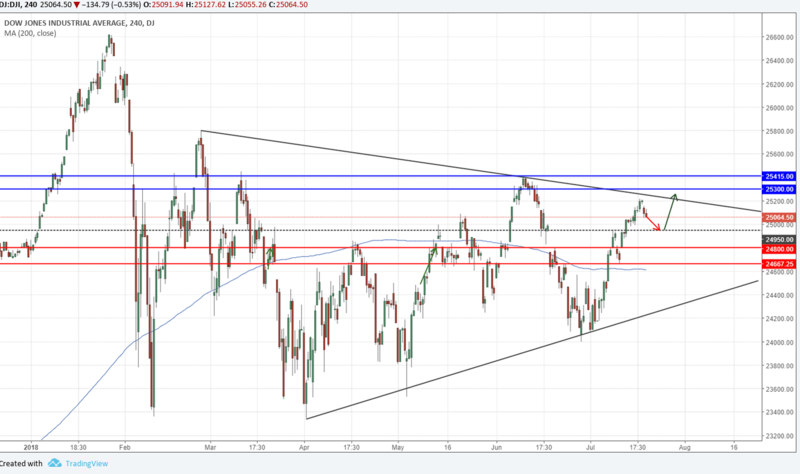 The index failed to break the trendline forming a lower high and pulled back, more downside is likely once price breaks under the 25000 towards 24800. On the flip side, if a bullish breakout above the resistance trend line at 25300 would confirm a potential uptrend continuation and possibly establish new quarter highs.